For Edgar, it probably means the end of his pursuit of a second UFC title, at least in the featherweight division. “He didn’t get hit until 4.5 minutes in,” Henry told ESPN. “I thought he was winning the round. Honestly, I was more pumped for this fight than the title. I think he cemented his legacy, taking on anybody, anytime — and beating a young lion would have shut up everyone asking about his age. “I’ll tell you one thing: I would love to see Frankie fight at 135,” Henry said. “Every time Frankie has fought somebody his own size, he’s done very well. “I re-watched the fight for the first time this weekend, and all these people had tweeted about how much bigger Brian looked. I watched it and said, ‘Holy cow, he was a lot bigger.’ It’s tough when you’re giving up size, height, and range. Frankie got caught as he overstepped. He paid the price, but that’s what you have to do to compensate for that range. You have to come hard. For Edgar, a move to 135-pounds would definitely present him with a significant chance to beat the reinstated champ Dillashaw. There has been significant talk of a bout between the ‘Snak in the Grass’ and Demetrious Johnson, so it would potentially be of little interest to Dillashaw to agree to fight Edgar. 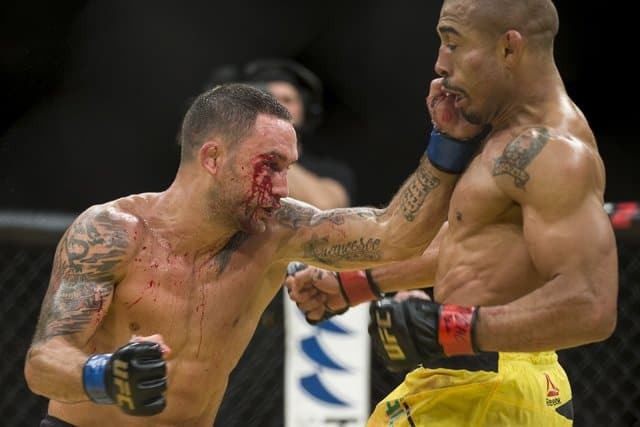 In terms of a spectacle, however, it would certainly pique the interest of UFC fans across the globe. Bantamweight is far from a weak division by any means. With Cody Garbrandt, Dominick Cruz, Jimmie Rivera, Rafael Assuncao, Marlon Moraes and many more vying for the top spot in the division, a victory over Edgar would be a massive scalp by anyone’s consideration. Whether it will be enough for Edgar to find himself working his way through the 135-pound division is another question altogether. The UFC can certinly count Edgar among the real ‘company men’ of the promotion. As Henry previously stated, his fan-favorite status is owed, in part, to his attitude of fighting anytime, anywhere. Edgar is a warrior, and if there is anyone deserving of a shot at joining the likes of Randy Couture, BJ Penn, Conor McGregor, and Georges St-Pierre in the two-title club, Edgar’s name is firmly around the top of the list, without a doubt.